In 2015, filmmaker and multimedia artist Agnes Varda visited Chicago in conjunction with a retrospective of her work. She’s seen here on the patio outside the Logan Center for the Arts. Few filmmakers anywhere enjoyed a heartier, more joyful third act than Varda. In 2017 she was awarded an honorary Academy Award — gallingly, the first to be given to a female director. At the 2018 Oscars her exuberant road-tripping documentary “Faces Places,” chronicling a roving photography project she embarked upon with friend and photographer JR, received a nomination, making Varda the oldest-ever nominee for any competitive Academy Award. In that film, Varda tells her cohort she hates working with an itinerary. “Chance, she says, “has always been my best assistant.” For decades, across various media, Varda found new and revealing ways to allow chance to flower. 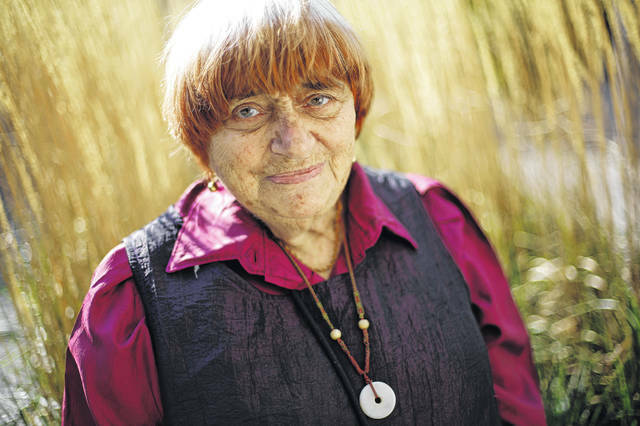 Agnès Varda’s unique cinematic vision since the 1950s has earned her a loyal following of enthusiastic cinephiles around the world. Her final documentary essay, “Varda by Agnès,” premiered in February at the Berlin Film Festival, where she received the honorary Berlinale Camera award. I met Varda in 2015, on a sunny day at the University of Chicago Logan Center for the Arts patio. On her final visit to Chicago, she was the subject of a weeklong retrospective showcasing her work as filmmaker, photographer and visual artist. We talked about “Cleo from 5 to 7,” a film made seemingly in real time, dealing with a Paris model waiting to hear about a potentially life-threatening biopsy result. The film itself ran about 30 minutes shorter than the title suggested, but the style was nonetheless real-seeming, spontaneous — Varda’s poetic approximation of reality. We talked about one of the retrospective’s video installations, “The People on the Terrace,” inspired by a photograph Varda made 51 years earlier, depicting a random group of people. Her film opened up that photo to imagine a scenario and a set of relationships among those people. She and five other people attended Morrison’s funeral in 1971. Her work came out of what was known as the Left Bank movement, as did the films of Chris Marker, Alain Resnais, Marguerite Duras and a few others. She experimented to the end. “I want to choose my life,” a girl says in “Les 3 Boutons,” one of her short films. Across seven decades of inquisitive, searching work, Varda asserted her place, value and choices, and how she saw life all around her.